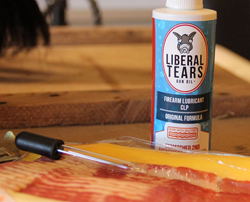 The geniuses behind Liberal Tears Gun Oil have now added a special ingredient to the oil, bacon. The gun oil manufacturer has added bacon to all of their bottles of Liberal Tears. Liberal Tears Gun Oil is already made with the freshest of tears straight from the crying eyes of liberals who are against the second amendment, but there is a new ingredient gracing the label of the Liberal Tears bottle these days. The gun oil manufacturer has added bacon to all of their bottles of Liberal Tears. The video that can be seen here shows the guys from Tactical Sh*t actually cooking bacon and harvesting the bacon grease which is then added straight to every bottle of Liberal Tears with an eye dropper. For the shooters who love guns and bacon, the gun oil promises to deliver a superior product. Customers who bought bottles before the coveted "now with bacon" sticker adorned the front, can get their new bottle here. The brand first started after a picture of homemade "liberal tears" lubing an AR-15 circulated on social media and went viral. After that many shooters were creating their own silly labels and taping it on their bottle of lube. Seeing a demand in the market for a product made from only the freshest of tears straight from the crying eyes of liberals, Liberal Tears was born. The CLP is a self cleaning, full auto rated lubricant that uses nano technology to reduce barrel temperature and increase shot accuracy. The oil actually bakes into the surface to create an even harder more slick coating and is 100% made in America.